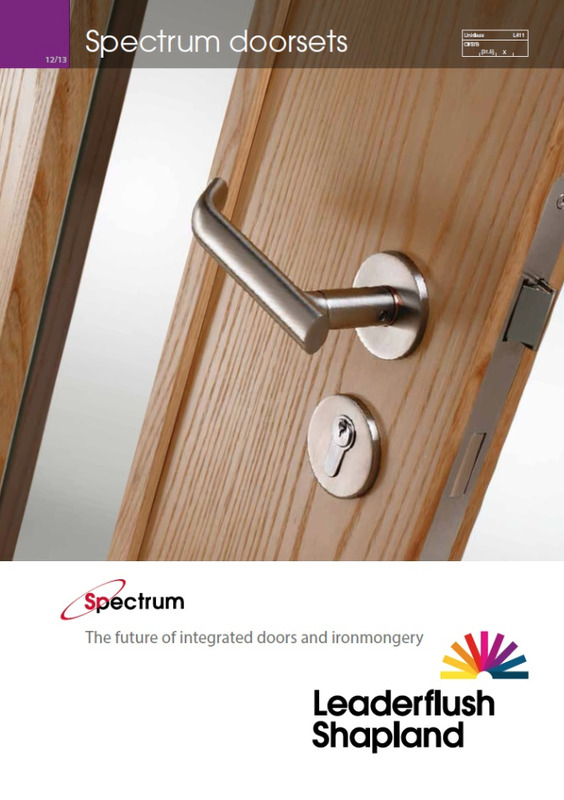 Bringing together market leading knowledge, expertise and professional capability, Leaderflush Shapland has introduced the Spectrum doorset – combining its timber door solutions with its Laidlaw ironmongery to provide a complete doorset solution. Hinging on the knowledge, expertise and critically, capability of service, that both Laidlaw and Leaderflush Shapland has to offer, the integration of the two companies allows for a more responsive approach to customer needs, enabling Leaderflush Shapland to provide the expert level of help and advice that is expected right from the very early stages of specification. Spectrum has, in part, been developed in preparation for upcoming legislative CE Marking requirements for internal doorsets, which are due to become the industry standard in 2015. By providing a complete doorset solution ahead of this deadline, Leaderflush Shapland can ensure specifiers and architects stay one step ahead. The concept behind the amalgamation is simple – by combining any door leaf design from Leaderflush Shapland with any of Laidlaw’s ironmongery ranges, Leaderflush Shapland can provide a totally integrated doorset solution; Spectrum, which combines the very best of Laidlaw and Leaderflush Shapland’s product offerings. The advantages of factory preparation cannot be overstressed. Whether for aesthetic reasons, to reduce the amount of on-site work during installation or to optimise the accuracy and efficiency of the working doorset, the time and effort put into preparing the door and frame in the factory for the glazing and ironmongery pays dividends. This is particularly so with items such as pivot sets, concealed door closers, lockcases and hinges where sections of timber need to be removed from the door and/or frame. All Leaderflush Shapland Spectrum doorsets are fully factory prepared for all the major ironmongery items except for surface mounted items. Hinges, door leaves and frames are factory machined and in the case of lift-off hinges, the hinges are pre-fitted. By consolidating ranges from the two companies to provide one complete solution, architects and specifiers alike can benefit from leading product expertise as well as a whole host of added practical and aesthetic benefits, the likes of which include certified performance, whereby the performance characteristics of the entire door, including ironmongery, are tested as one complete unit – this ensures the doorset is compliant with the likes of fire or acoustic testing requirements, for example. What’s more, by opting for an integrated doorset solution, like Spectrum, specifiers can also be sure that all components are fully compliant with relevant BS/EN standards and CE marking too. For further information on Leaderflush Shapland or to download your copy of the Spectrum brochure visit www.leaderflushshapland.co.uk .